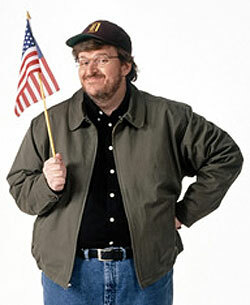 Is Michael Moore a 9-11 Truther? On Sunday, film director/producer Michael Moore gave a special sneak preview of his new schlockumentary “Sicko” at the Regal Theatre in Times Square, New York. After the screening, he was approached by two brothers who run a website called We Are Change, which appears to be largely another “9/11 Truth” organization. At first, Moore was trying to elude the pair, but finally answered a few of their questions surrounding the events of September 11, 2001. Well, I’ve had a number of firefighters tell me over the years since 9/11 that they heard these explosions. Uh, that they believe that there’s much more to this story than we’ve been told. I don’t think the official investigations have told us the complete truth. They haven’t even told us half the truth. And, so, I support, and I hope, you know, if there’s a new administration or somebody could open up a new investigation into this before we get too far away from it to find out the whole truth. Let me just give you one thing that has, I’ve asked for for a long time. I’ve filmed before down at the Pentagon before 9/11. There’s got to be at least a hundred video cameras ringing that building, in the trees, everywhere. They’ve got that plane coming in with a hundred angles. How come we haven’t seen the straight – I’m not talking about stop action photos, or. I’m talking about the video. I want to see the video. I want to see a hundred videos that exist of this. Why don’t they want us to see that plane coming into the building? Because, you know, if you know anything about flying a plane, if you’re going 500 MPH, if you’re off by that much, you’re in the river. To hit a building that’s only five stories high that expertly, uh, I believe that there will be answers in that videotape, and we should demand that that tape is…You see, I’m not very good at the physics and all that. But I, but I, believe me, the questions need to be answered, and I intend in my own way to find some answers. So, thank you for whatever you’re doing. Somehow I doubt that any of the mainstream journalists interviewing Moore will address his views concerning this issue.